We work closely with Congress, the White House, and the U.S. Department of Education to accelerate the college and career readiness of students through public policy. Through our community of leaders, we build relationships with policy makers and legislators to communicate the importance of expanding and enhancing college readiness programs that serve low-income and first-generation students across the nation. Our goal is to expand the GEAR UP program so that one million students can benefit from the remarkable work of our community. 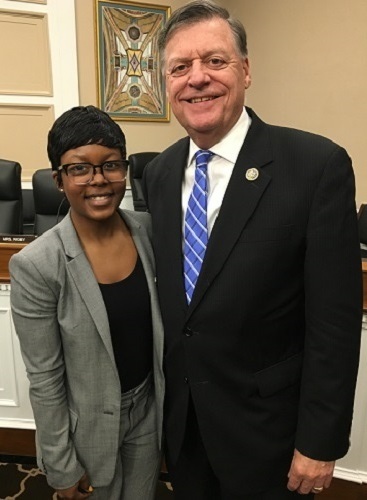 Jazmin Goodwin, GEAR UP Alum, and Congressman Tom Cole (OK-04) following Jazmin's testimony calling for increased GEAR UP funding. Ensure that GEAR UP remains a national priority for Congress and the administration. Secure a Fiscal Year 2020 GEAR UP appropriation of $395,000,000 (an increase of $35,000,000) so that an additional 70,000 new students can benefit from GEAR UP's work. Promote the need for an open GEAR UP competition in 2020. Advance our community's priorities for reauthorization through the GEAR UP for Success Act of 2019. We strongly support the bipartisan, bicameral GEAR UP for Success Act of 2019, which would reauthorize and improve the GEAR UP program. Reducing administrative burden for GEAR UP grantees. We are working towards a future where every student, regardless of income, has the opportunity to succeed in life after high school. Our efforts to advance GEAR UP depends on the grassroots action of our stakeholders, partners, and GEAR UP alumni all over the nation. Join our network of advocates by taking simple actions to help ensure that Congress continues to prioritize GEAR UP. Voice your support for GEAR UP with your Members of Congress. Using your mailing address, you can find your elected officials, email your Congressional offices, and contact local media outlets. Our weekly GEAR UP Digest provides our advocates with legislative updates, policy analysis, and provides simple action steps you can take to become a better advocate for GEAR UP. Need a primer on how to be an effective advocate at the federal level? Our toolkit provides a background on the legislative process and an overview of the nuts and bolts of effective advocacy.